Delton Cabinets is proud to design, manufacture, assemble, and finish all our cabinetry right here in our Edmonton facility. Since incorporating in 1958, we have expanded from a garage to a 60,000 square foot modern manufacturing plant. We are proud to provide great jobs for over 60 skilled team members. In 2014, our new ownership group made a conscious decision to keep manufacturing right here in Edmonton, not just because we believe in our city and our people, but also because it makes sense for our customers. We have access to the best tradespeople in the world: our skilled craftsmen produce high quality products with fantastic efficiency. Manufacturing locally also enables us to provide the most responsive customer service, from the design stage, right through to installation and beyond. The mill shop is the first stop in turning beautifully rendered designs into real cabinetry. 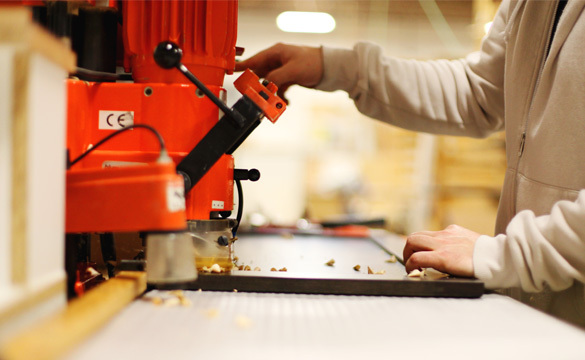 Using our state of the art automated equipment, staff cut and machine cabinet components, preparing them for assembly. At the same time, our solid wood mill shop begins the process of turning rough, hardwood lumber into fine cabinet doors. 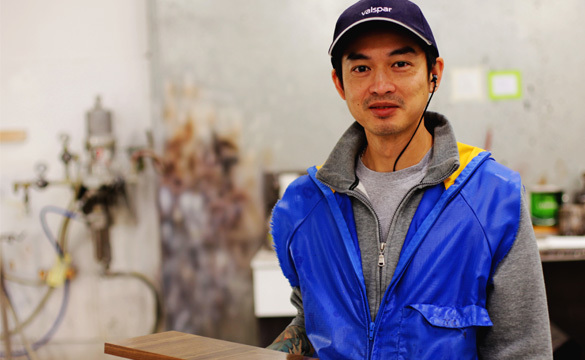 Our door maker, Kali, has been with Delton Cabinets for over 40 years! Delton Cabinets is proud to have many long-term employees – in fact we currently have 10 employees that have been with our company for more than 20 years. We honour and appreciate their commitment to Delton Cabinets and to the customers we serve. Delton Cabinets has a full service finishing shop that offers coloured lacquers, custom stains, and glazes of all types. However, we are most recognized for our custom hand-rubbed stains. This is a rarity in today’s market, where the vast majority of cabinet doors are spray-stained on an automated finishing line. This is an area where Delton Cabinets has made a conscious decision not to automate our production. Spray line finishes simply cannot match the lustre and brilliance of hand-rubbed products. Side-by-side, the difference is striking. Our finishes highlight the true beauty of wood and set our cabinets apart from all others. On our assembly line and in our “special projects” department, our cabinetmakers and other skilled tradespeople can build just about anything. This department is where automated processes are combined with fine handwork to create the kitchens of our customers’ dreams. Here, staff assemble the cabinet boxes, drawers, mouldings, and other elements of a custom cabinetry order. We have become famous for our parabolic hood boxes and other advanced curved elements. Delton Cabinets is a proud supporter of the cabinetmaker apprenticeship program at NAIT and encourages our staff to develop their skills through apprenticeship training.